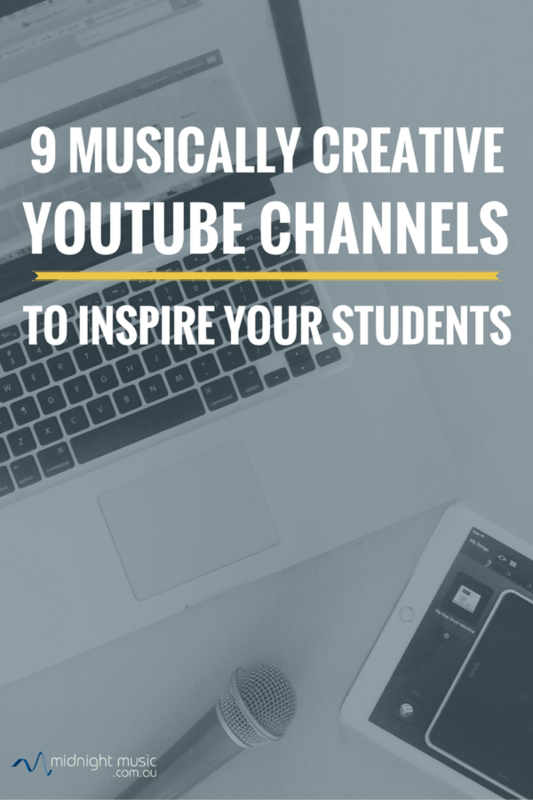 I have a few go-to Youtube channels that I visit when I’m seeking a little inspiration and a few days ago I wondered whether other music teachers had their own favourites too. So I asked Facebook-land. It turns out many of us love the same ones! There were too many to fit into one post so I’ve divided the list into categories. This first collection features covers, remixes and a cappella videos. Thanks to everyone who let me know their favourites. In addition to viewing the examples videos from each channel below, I’d encourage you to check out their entire channel and subscribe to any that you like. Click on the channel name (in green below) to see the entire collection of the artist’s videos. Please note: I can’t guarantee that ALL of the videos on the channels listed below are G-rated. Please make sure you watch the videos the entire way through to check that it is appropriate for your students before showing it in class. I seriously LOVE Andrew Huang’s creative remixes that are often made with found sounds. Also recommended by music teacher Chris Burns on Facebook. You and I have similar taste Chris! Another favourite of mine. Pogo creates new music by remixing sounds (and visuals) from movies. Sampled sounds effects, dialogue, music and more. Take a look at his collection of Disney remixes. WOTE leapt to fame with their cover of Somebody That I Used To Know which features all 5 members of the band playing a single guitar. They’ve continued to produce innovative covers using simple instruments. KHS is a young music producer that creates innovative videos and arrangements that often feature his (talented) musician friends. Also recommended by music teacher Chris Burns on Facebook. The group that brought a cappella to the mainstream. Also recommended by music teachers Robyn Windham, Tara DeJaegar Roman & Chris Burns on Facebook. A cappella multitracking at it’s best. Also recommended by music teacher Stephanie Sanders on Facebook. Although there are not many videos on their channel, it’s worth having a listen to their amazing sopranos (!). Also recommended by music teacher Kristen Jones on Facebook. Also recommended by music teacher Iris Woodruff Redmond on Facebook. As mentioned above, there were too many great channels to fit into a single post so I will do a follow-up soon with some of the others. I just received word that I will be teaching an eighteen, 1/2 hour session of music tech-and anything goes as far as content! So excited but have no idea where to start. My kids have access to an individual macs and ipads or as a group- the Promethean board. Sounds exciting Linda! You have some great resources at your disposal 🙂 There are quite a lot of ideas in my other blog posts, so feel free to take a look around. And if you’re keen to get some personalised help (and online training videos) you might like to join my online community. Good luck with it all! Thanks for the article on YouTube channels. I have found Joe Penna’s channel MysteryGuitarMan to be useful. He has been around for a very long time and as a result inspired many others to do similar ptojects . I LOVE so much of your work! -so clear for me as a teacher (of the older generation!) and content that students really need to be an engaged learner. I am trying to use soundinfusion, have created a teacher login but then can’t access some pages from the homesite. Can you help? Search for ‘The Flopatron’ -a programmed arrangement of computer components to play well-known songs.